the care and precision with which the sides are hewed. A long straightedge is used to detect high spots that are then hewed down. the use of dozens of small pegs to achieve a consistent wall thickness. 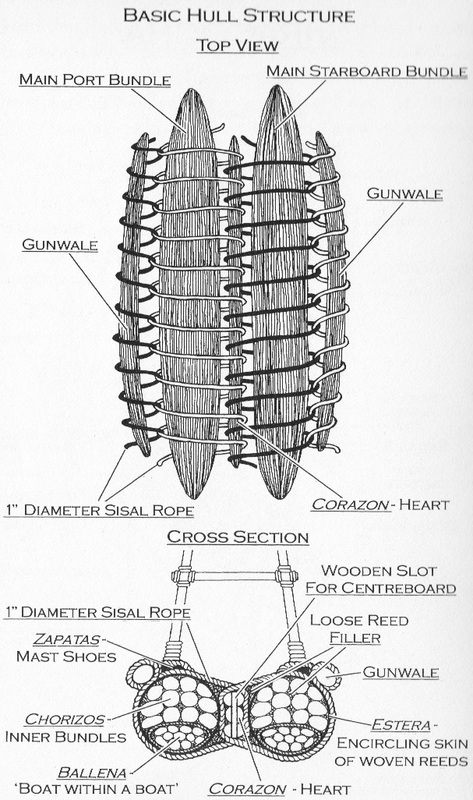 Dozens of holes are drilled into the outer surface of the log, then small pegs of a consistent length are pounded into the holes. 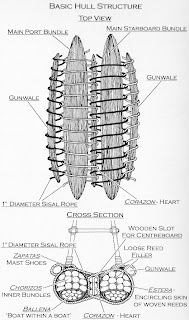 As the inside is hollowed out and the inner ends of the pegs revealed, the builders know they have hollowed enough in that place. 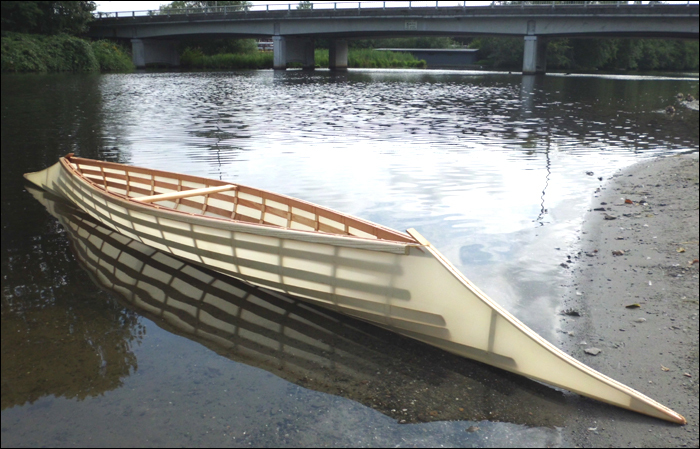 Note how the canoe is carefully lined off first, so that the pegs are installed at consistent intervals. the fact that the top of the log is not hewed off flat before being hollowed. The builders leave a fairly narrow opening and hollow out the log wider beneath it. When the hull is expanded, this leaves the sides higher and produces a nice sheerline that's higher amidships. 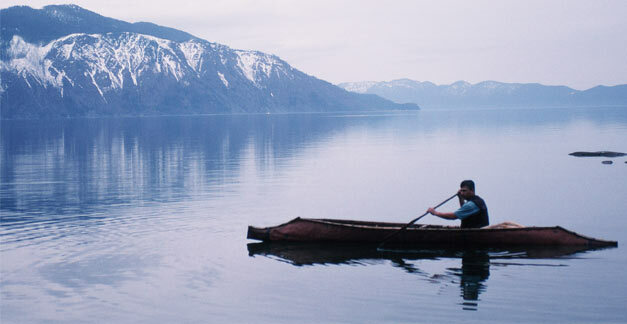 the canoe is paddled kayak-style: the paddler sits in the bottom and uses a double-bladed paddle. It may seem out of place to examine the shipbuilding methods of the ancient Greeks and Romans in a blog whose subtitle is "small craft outside the Western tradition," given the fact that so much of Western culture is directly descended from those early civilizations. 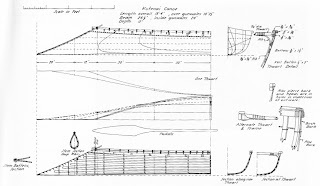 But the boatbuilding methods they employed ultimately went nowhere -- they died out and ended up contributing little to the boatbuilding traditions that we currently recognize as Western. The ancient Greek and later Roman method differed from both of these. Planking was laid edge to edge, for a smooth skin like a carvel hull's. 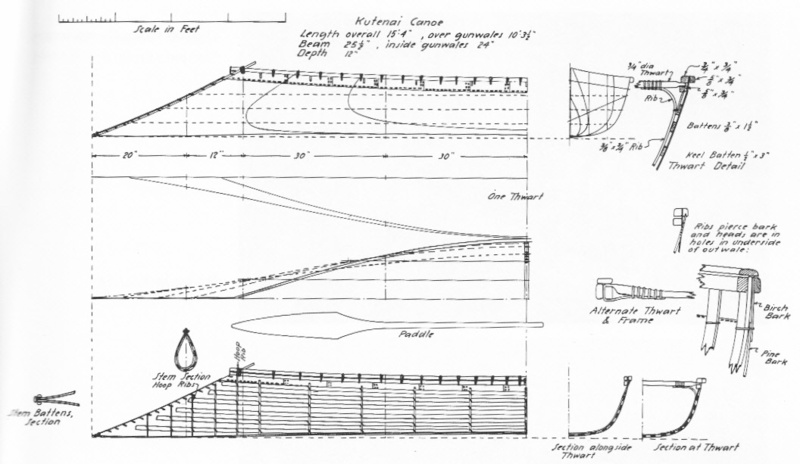 But construction proceeded shell-first, as in clinker construction. 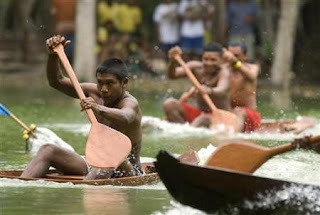 Most interesting was the method used to fasten the planks to one another. 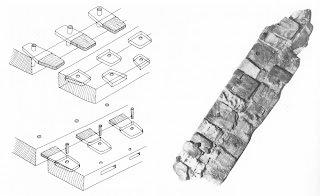 Left: schematic showing the method of mortise-and-tenon joinery, with pegs to fix the planks to the tenons. 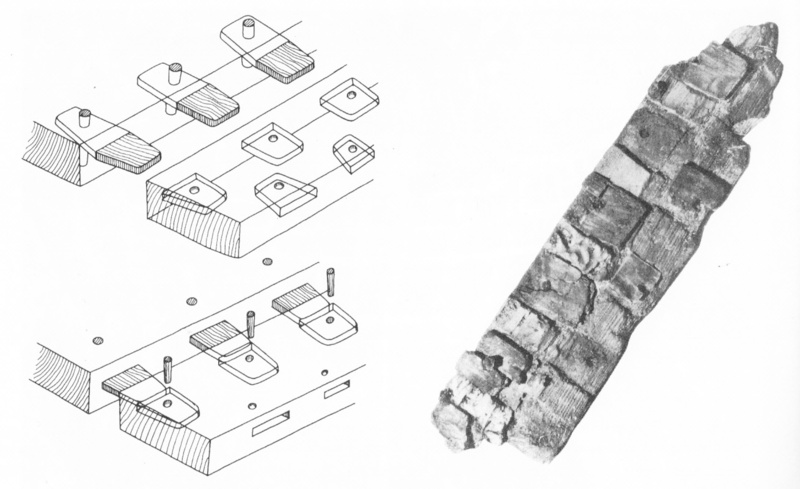 Right: a plank recovered from an ancient shipwreck, split down the middle, shows how a large percentage of the plank was taken up by the mortises and tenons. As can be seen in the images above, both edges of the planks were deeply mortised, and held in alignment by free tenons. 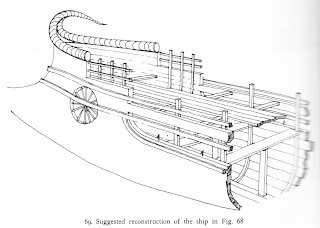 The planks were then drilled through the tenons at both of their ends, and tight-fitting dowels were driven through the holes to hold the tenons in place. In this amazingly labor-intensive fastening method, the mortises took up a large percentage -- often more than 50% -- of the length of each plank's edge. Sometimes, the mortises were staggered alternately toward the inner and outer faces of the plank, so that they actually overlapped, thus totalling more than 100% of the length of a plank's edge. 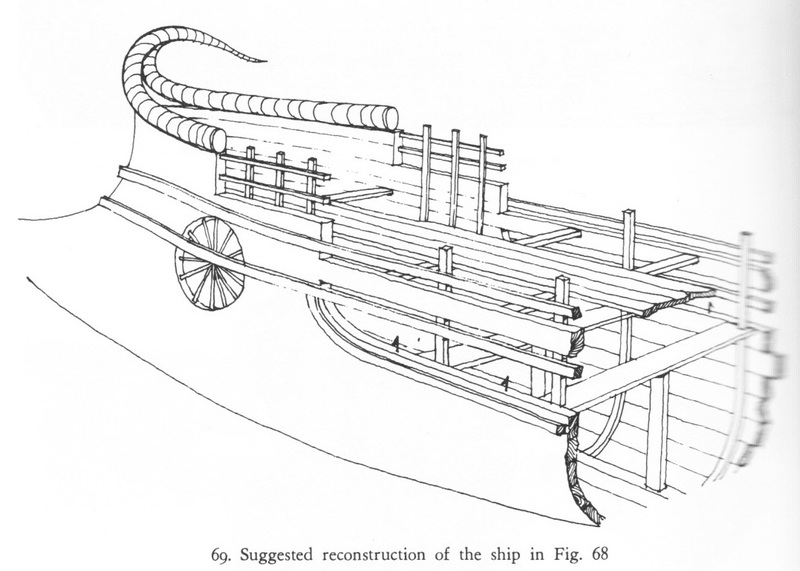 Having been used for thousands of years in trade, war, and explortation, it could hardly be said that this method of shipbuilding was a failure. But it was ultimately superseded by methods far less time-consuming to employ. The clinker method was developed in Scandinavia. The source of the carvel method is subject to dispute, but it appears to have originated in the Mediterranean independent of the Greek and Roman tradition. Both ultimately overlapped in northern Europe and made their way to the Americas. 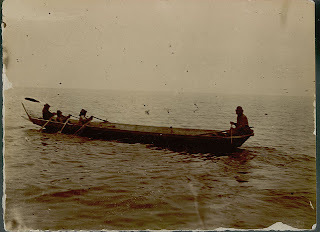 There's a nice post in the latest edition of Old Salt Blog about the phinisi, a traditional sailing craft of the Bugis people of Indonesia. 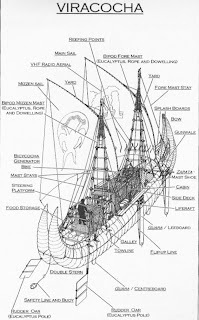 Scroll down the post for some links to more articles on this interesting craft, which appears to me to be related to the dhow. 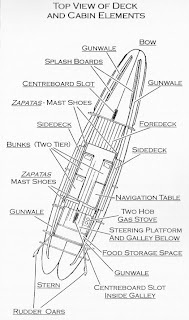 Note in the photo the twin steering rudders that extend through quarter galleries, much like the steering arrangement on ancient Greek galleys. Capt. J.C. Voss, one of history's greatest small-boat sailors, was also one of its least pleasant. 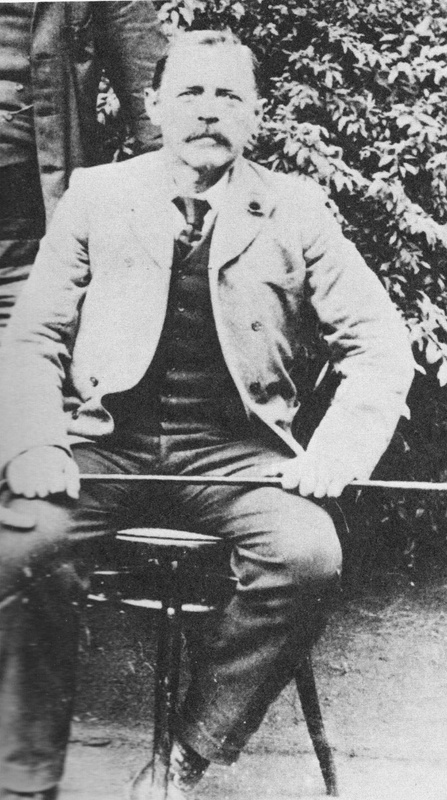 A lifelong mariner, Voss was a Canadian, living in Victoria, BC, in 1901. 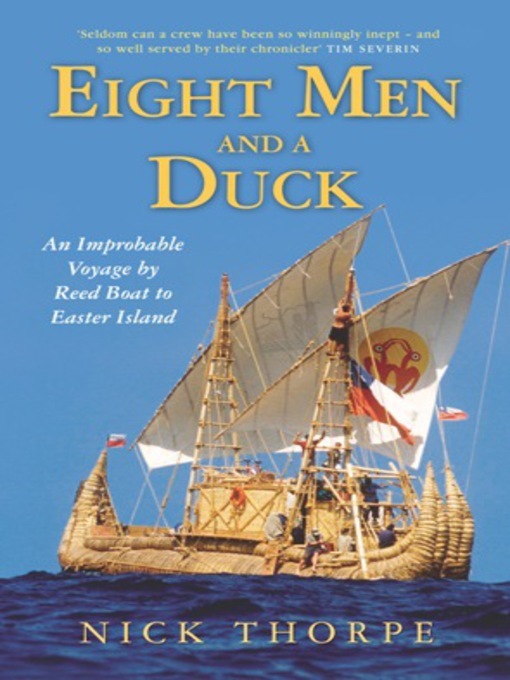 He was intrigued by Joshua Slocum's first-ever solo circumnavigation of the globe in a small boat between 1895 and 1889, and by the success of his book Sailing Alone Around the World in 1900. 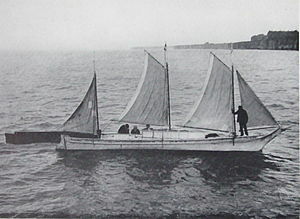 When Norman Luxton, a journalist, proposed teaming up for a similar trip in a smaller boat than Slocum's Spray, Voss agreed. 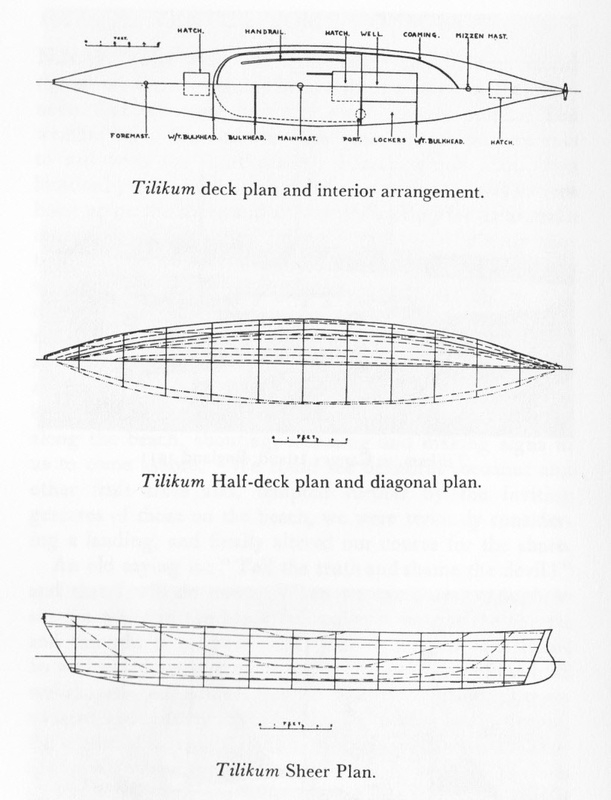 As Luxton had no sailing experience, Voss would handle things nautical, while Luxton would document the voyage. 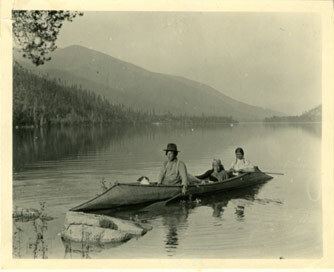 Voss purchased a large red cedar dugout canoe from a Nootka Indian on Vancouver Island, describing in The Venturesome Voyages Of Captain Voss how he got the seller drunk in order to obtain better terms and, in doing so, knowingly broke Canadian law. 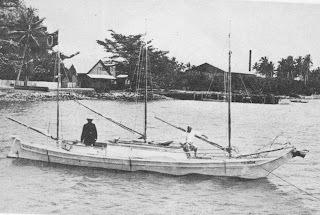 To prepare it for sea duty, he substantially modified the boat, raising the topsides, adding a cabin and cockpit, installing frames, floors, keelson, keel, water tanks, fixed and movable ballast, rudder and tiller, and a rig consisting of three small stayed masts, a jib, gaff sails on the foremast and mainmast and a leg-o'-mutton sail on the mizzen. 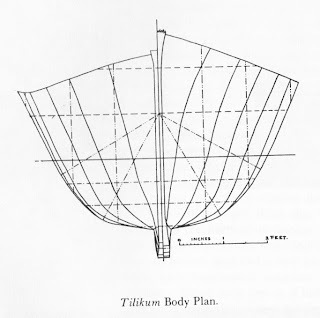 Named Tilikum ("friend"), the boat was 38' LOA and 5'6" in beam. Leaving Victoria, the two made their first stop on Vancouver Island, where they looted an Indian burial cave for "curios" (including human bones) to sell later on their journey. This was no abandoned burial site: it was actively venerated by the local people, but Voss seems to have thought nothing of the ethics of his action, evidently assuming that Indian sensibilities were irrelevant and that being white gave him a prerogative in this area. 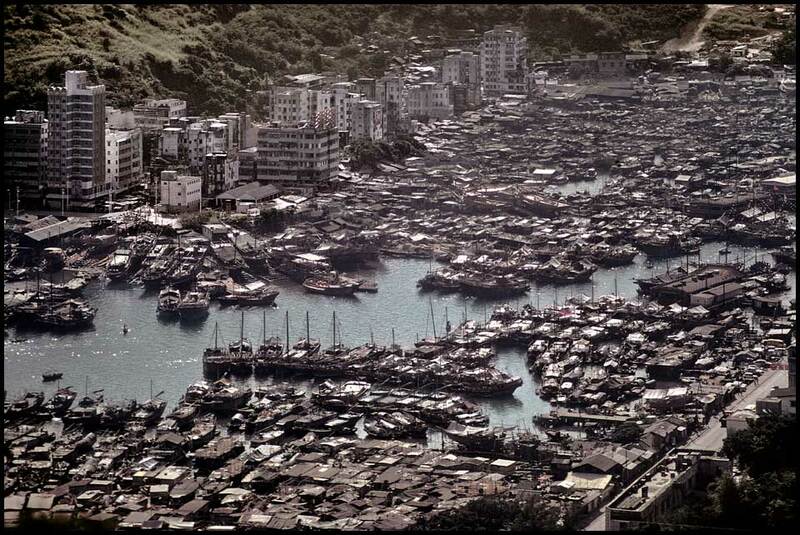 At Penrhyn Island, their first landfall in the Pacific, Voss assumed that the natives would be dangerous cannibals. 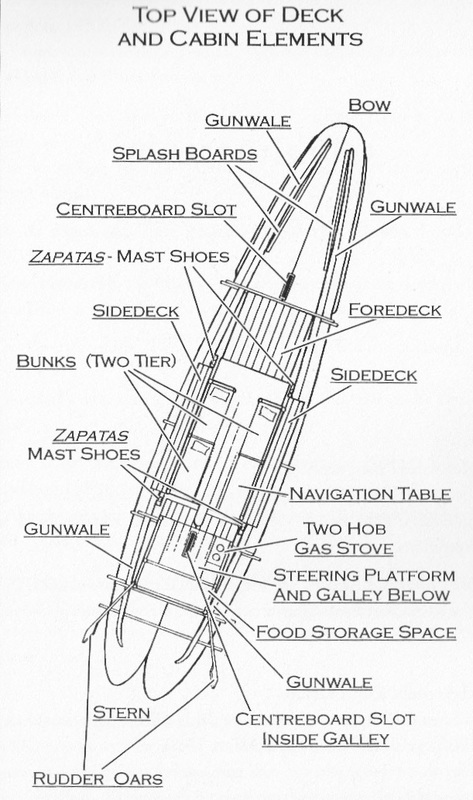 Before entering the small harbor, he and Luxton fortified their cockpit with sandbags and prepared their guns (there were at least four aboard) to repel boarders. It turned out that the natives were perfectly friendly, having been satisfactorily "civilized" by a European missionary. As the voyage continued and further contacts were made with numerous non-European cultures, this inherent distrust seemed to diminish, though not Voss's disdain. 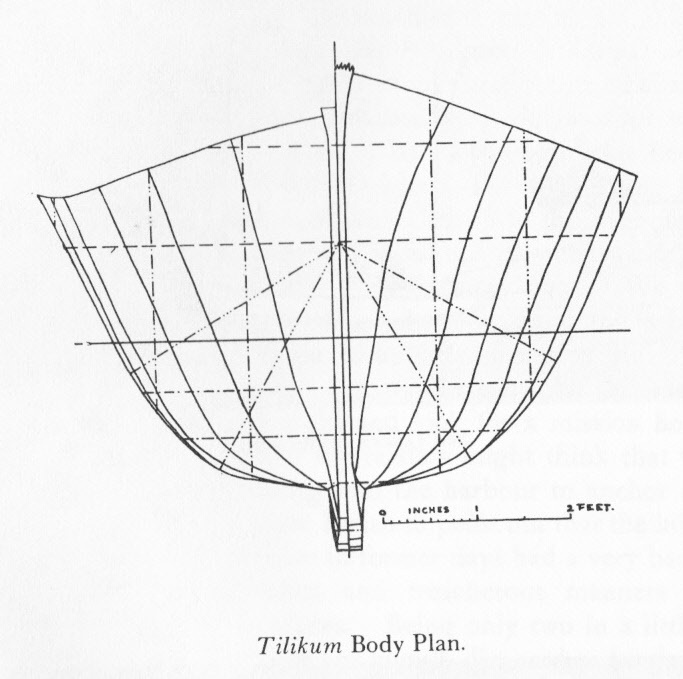 Luxton proved to be a bad sailor, and he left Tilikum in Sydney, Australia. He was replaced by a succession of substitute mates, none of them lasting very long. Apparently, Voss was an unpleasant shipmate. On one passage, his mate disappeared -- swept overboard in a storm, according to Voss's account, although some have speculated that Voss murdered him. 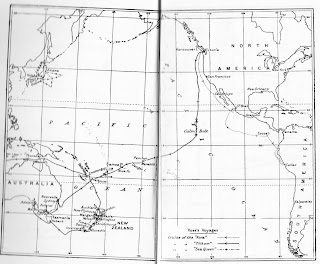 A splendid critique in the next morning's newspapers (in Wellington) served as an instigation to us to speak on several succeeding occasions to full houses, and at the request of a white Maori chief from Palmerston North, a fair inland city, we put the boat on a train and, in company of the chief, journeyed overland to that place. In the country surrounding Palmerston live many Maori farmers who came to town by the hundred (sic) to give us a call. They were more than pleased to see a canoe which had crossed the ocean to their country, and the fact apparently strengthened their belief that in days of yore their ancestors had emigrated in large canoes to New Zealand from some distant region of the Pacific. 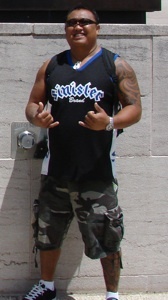 One Maori, who spoke English fluently, told me that he had never credited the legend, as he thought it impossible to cross the ocean in such frail craft. 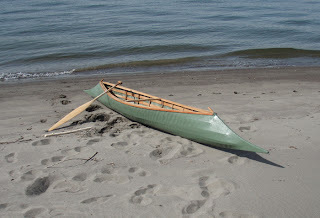 "And now, as I see with my own eyes that you have covered thousands of miles in this Indian canoe and have arrived safely on our shores, I do not longer question that my forefathers can have accomplished the same!" 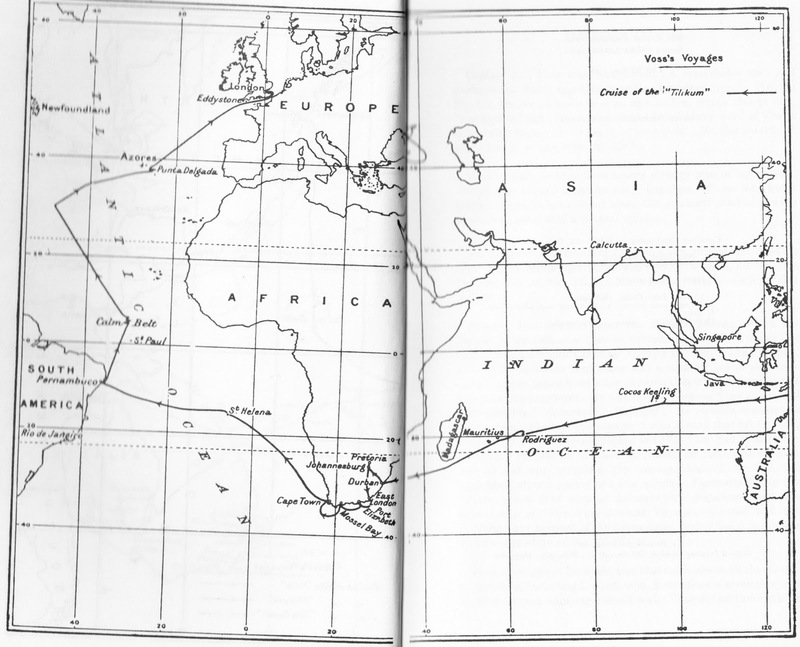 The maps show the rest of his voyage, which he completed in England in 1904, three years and three months after it began. 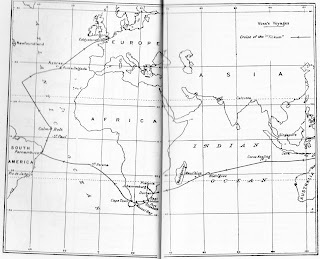 While he did not return to the west coast of North America, he used the term "circumnavigation" to describe his voyage, on the rationale that he had crossed the three major oceans. 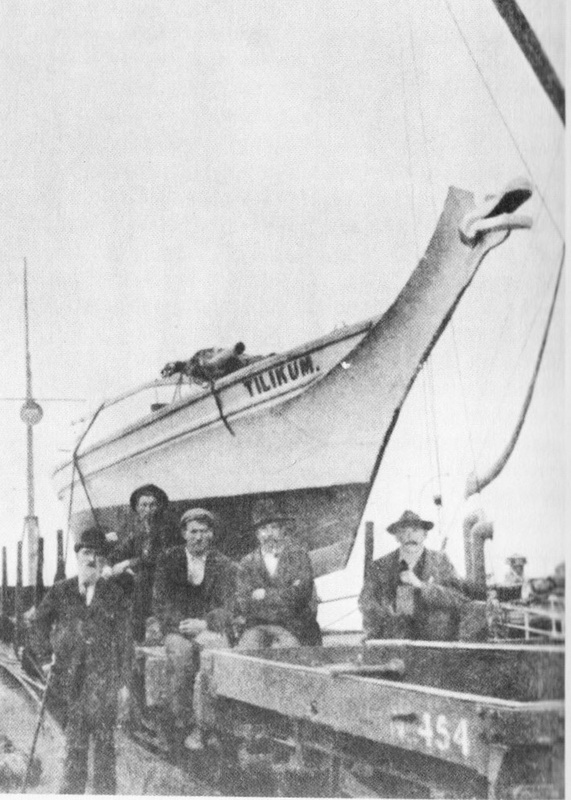 Voss and Tilikum weathered some horrendous storms, often relying on a sea anchor -- a device in which Voss was a firm believer and great champion. 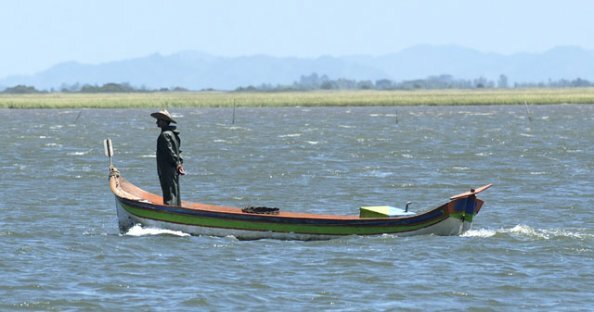 He was undoubtedly a seaman of great skill, and his choice of boat and the way in which he outfitted it demonstrate superb insight into small craft design for ocean voyaging. Tilikum is now on display in the Maritime Museum of British Columbia. The Ainu people of Hokkaido, Japan's northernmost large island, are culturally distinct from the Japanese. (See earlier post.) 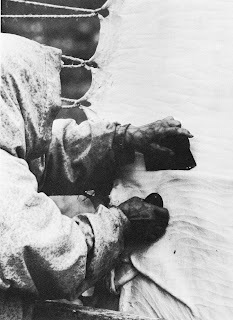 Frequently depicted as a primitive, hunting/gathering culture, the Ainu actually maintained a sophisticated trading economy prior to the 19th century. 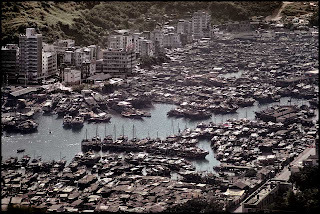 The Ainu conducted trade with mainland Asia, especially with ports on the lower Amur River (now the border between northeastern China and Russia), as well as with Korea and with other parts of Japan. 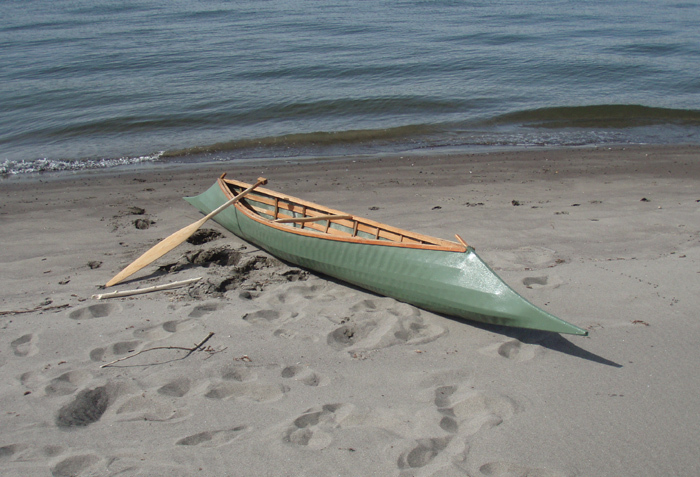 They used sewn-plank boats called itaomachip, built on an expanded dugout base and powered by both oars and sails as shown below. Some of the boats, at least, were about 50 feet long. In this ca. 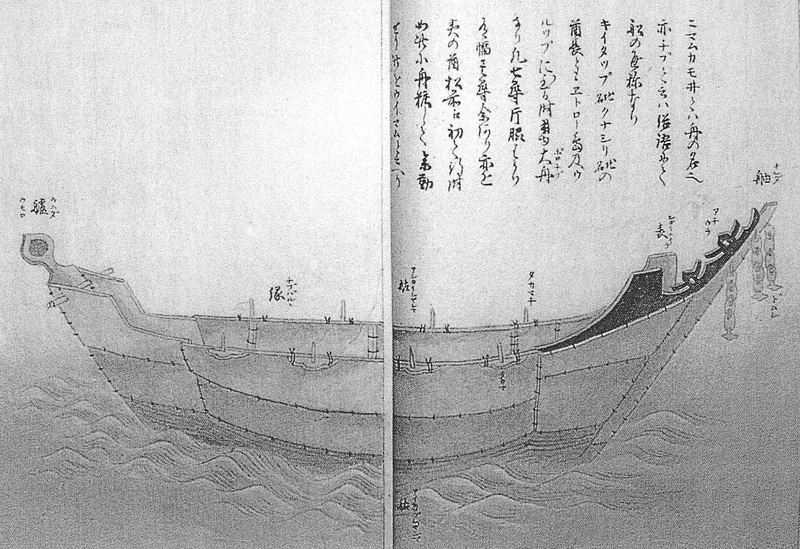 1798 illustration of an itaomachip, the rowers are Ainu and the passengers are Japanese merchants. Note the woven mat sail on an interesting double-mast rig. 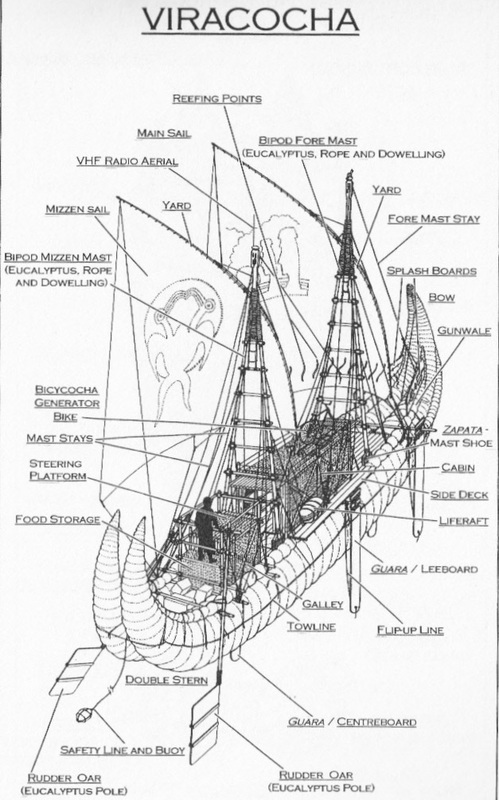 The masts can apparently be moved freely, tilting them forward or aft, relocating their bases forward or aft, and possibly even port to starboard. This might create a great deal of flexibility in the set of a very simple rig, ranging from squaresail to something approximating a fore-and-aft sail in a number of configurations. 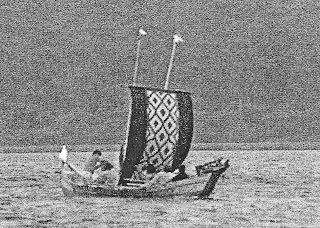 Taking advantage of a law that banned almost all Japanese nationals from engaging in foreign trade, the Ainu exported their own products (furs, marine products), and acted as middlemen for Japanese merchants, exporting Japanese manufactured goods like pottery and ironware, and importing silk, glass and metal products, which the merchants sold for huge markups. But in 1809, this semi-black-market trade ended when the shogun decided to take over Japanese import/export activities for itself. It was then that the Ainu were forced into a life of subsistence foraging. 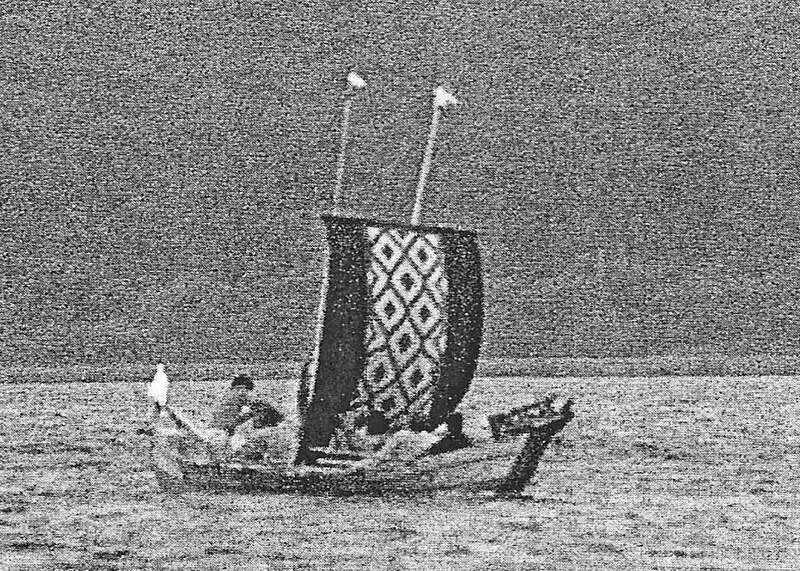 In 1989, after a gap of almost 200 years, three Ainu men built a 45-foot long itaomachip. 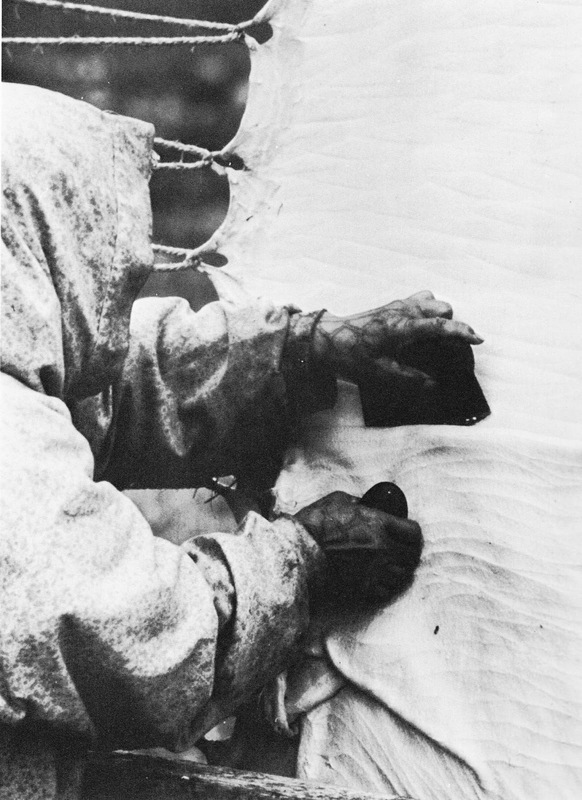 Team leader Tokuhei Akibe initiated the project in 1988 as a means of reviving Ainu cultural heritage, enlisting the assistance of the National Museum of Ethnology in Osaka. 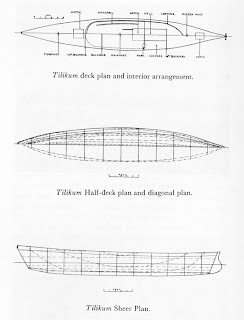 The design was derived from old illustrations like the two shown here. The plank stitches are clearer in this illustration. Note the elaborate decorations at both ends. 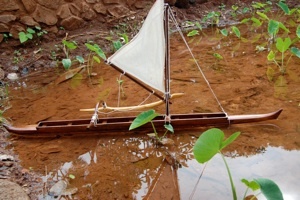 One of the first difficulties encountered was the acquisition of a katsura tree large enough to form the boat's dugout base, requiring intense negotiations with the management of an experimental forest -- the only place in Hokkaido with a tree of the necessary 3' diameter. Hollowing the dugout, by alternately burning and chopping, took a full month. "Expanding" it by filling it with water, and then heating the water with hot rocks, was described as the most difficult part of the project. The sides were then raised with 16"-wide pine boards and sewn with 325 feet of hemp rope. (The two processes of expanding and extending the hull are common to many other dugout boats worldwide.) 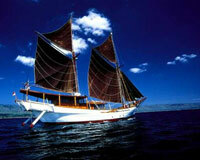 Sea trials confirmed the good handling and seaworthiness of the type. 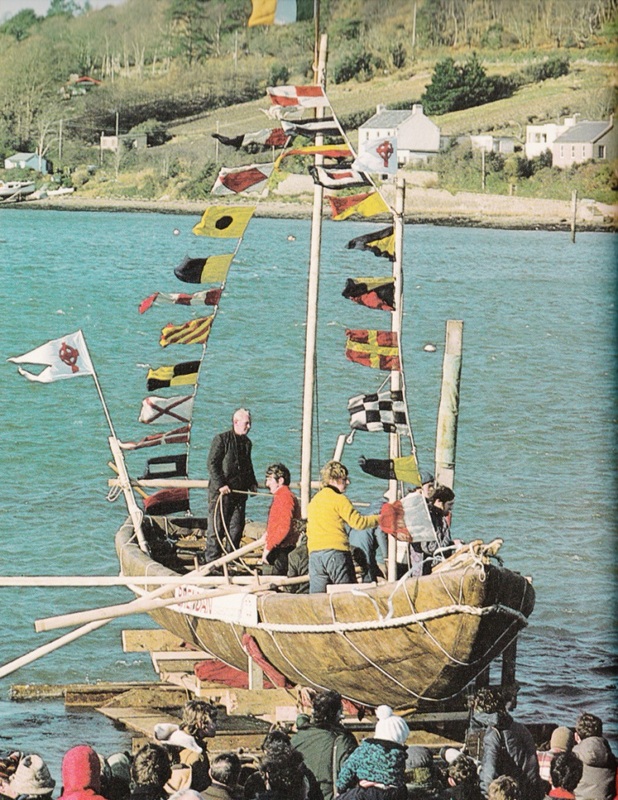 The 1989 reproduction boat, looking mighty fine under sail. (It seems to be much smaller than the 45' LOA reported in the article cited here.) As of 1999, it was on display at the National Museum of Ethnology, Osaka. Ainu: Spirit of a Northern People . Many thanks to Yoram Meroz for this article and his insights. 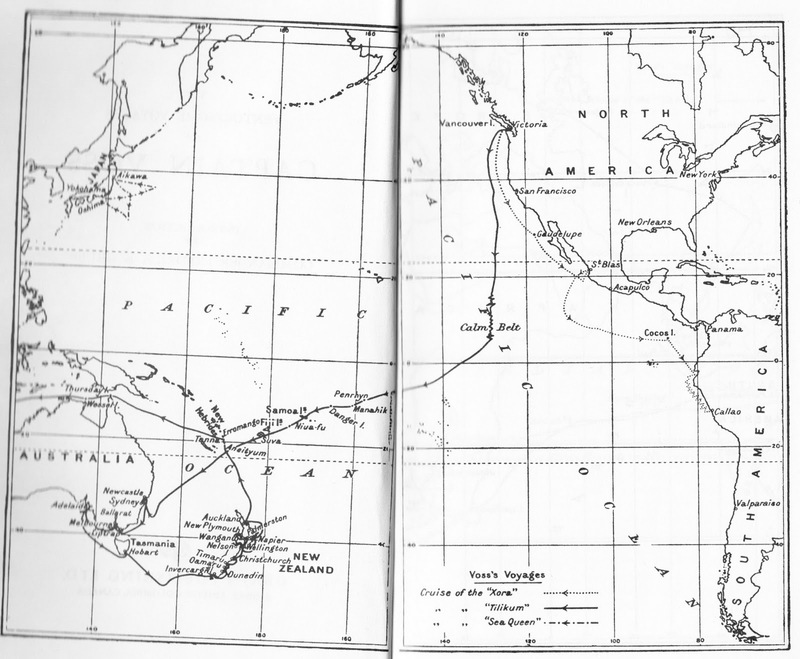 In 1806, the U.S. 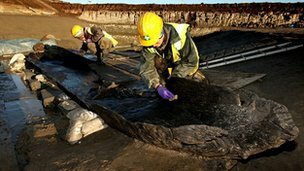 Corps of Discovery -- also known as the Lewis & Clark expedition -- took a dugout canoe that didn't belong to it from the Clatsop people in Washington state, at the mouth of the Columbia River. 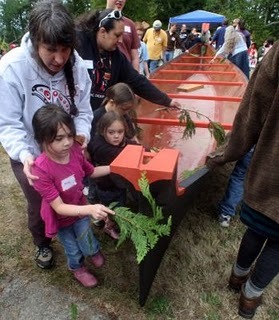 Now, better late than never, descendants of William Clark have presented the Chinook Indian Nation (to which the Clatsop tribe belongs) with a so-called "replica" in order to make amends. While it's doubtful that the stolen canoe was documented closely enough to call its replacement a replica, the gesture is certainly a good one, and the Chinook people accepted it in an elaborate ceremony. Here is a straight news story with further details, and here is a bit of cultural commentary. 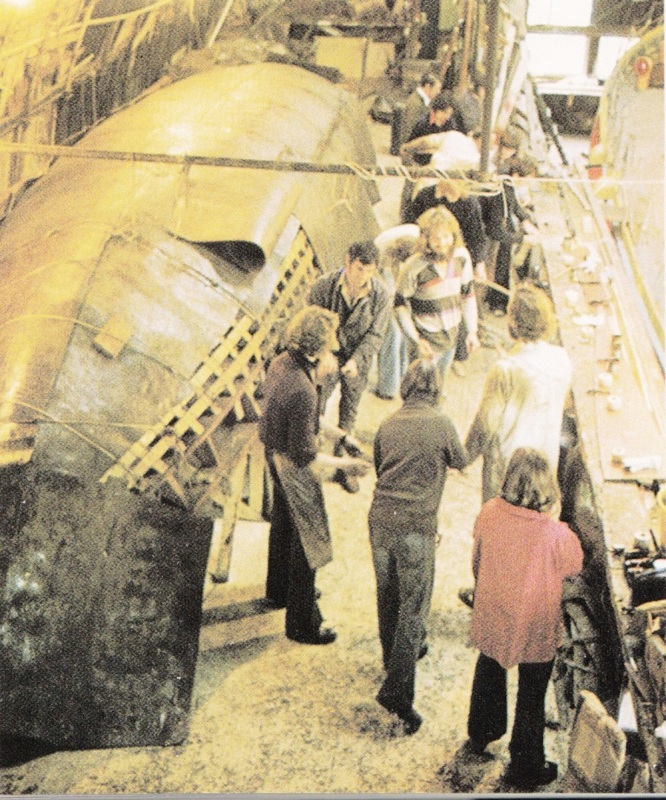 Aside from the photo above, I haven't found any details about the boat itself or its builder. 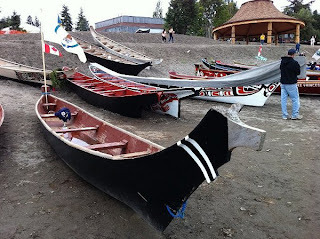 Indigenous Boats will go dark -- or at least quite dim -- for the next month, as I have a large project -- unfortunately not boat-related -- to complete on tight deadline. 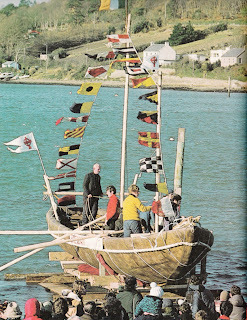 We'll be back with more posts about small craft outside the Western tradition as soon as the decks are cleared. Thanks for your patience.